Internet of Things solutions require that sensors, devices, equipment and appliances can be connected to the Internet. There are many different wireless and wired protocols to consider – Bluetooth, Bluetooth LE, ZigBee, Z-Wave, WiFi, 6LoWPan, EnOcean, ModBus, to mention a few. On top of that there are several IoT Resource and Device Adaption frameworks like IoTivity and AllJoyn. Several different messaging protocols like MQTT, AMQP and XMPP are around. An application developer are faced with several problems that cause headache. Firstly, they need to master several different technologies and go through framework specific APIs. Secondly, applications developed for one framework will not work in another framework. Thirdly, the data collected and the actions provided by devices needs to be mapped to the application business model. Applications are written from a business point-of-view, where the objects are “Robot”, “Manufacturing Cell”, “Line”, “Shop Floor” while sensors and devices produce events like “Meter56223” and can be controlled using commands like “Move Axis X1 to Position 5”. The solution to these problems are a software-defined gateway, a concept being innovated by CNet through the LinkSmart .net software gateway. It acts as a bridge between the digital world and the physical world, allowing applications and apps to talk to, control and observe objects in the physical world through a common software gateway. The Linksmart .net gateway provides mechanisms for routing requests regarding the physical world to the appropriate software resource that is able to fulfil the request, such as reporting the temperature in a particular office space or the current electricity consumption of an household appliance. The gateway also provide means to detect and act on events that takes place in the physical world, such as a door was closed. Observations and state changes in the physical world can be logged and reported locally or to the cloud, thus providing the necessary facilities to create and make use of big data. The fact that Linksmart.net is a software-defined gateway makes it very flexible and your applications future-proof and independent of changes to hardware and low level protocols. The Linksmart.net gateway is fully programmable and available as Open Source. 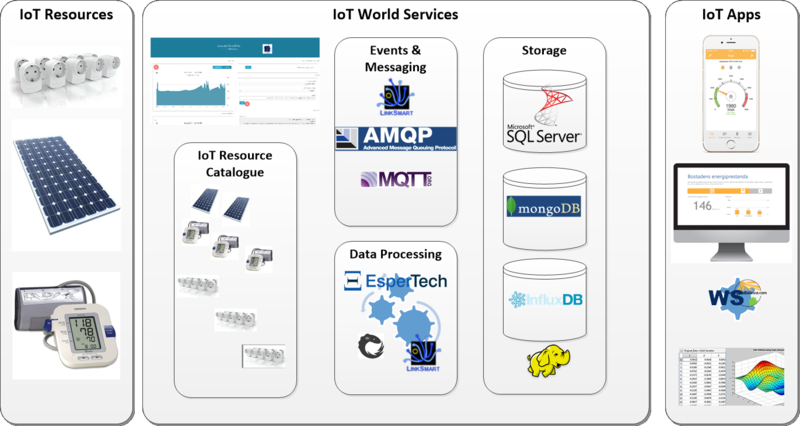 Visit the IoTWorldServices to learn more and download. A set of developer tools are available to allow configuration and administration of your IoT World.